The transformation of an old industrial site at Beenleigh for Stabilised Pavements Australia is almost completed. Workshop extension, truck wash bay, new office building, and extensive environmental and landscaping works to the entire site will be finished in a couple of weeks (mid December). J&B Projects are proud to be working with such an established Australian owned and operated company. The team at Stabilised Pavements are ready and keen to move in and start using their new offices. 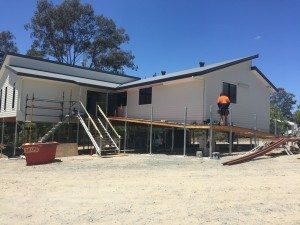 The Duplex project at Benowa is starting to take shape with the external claddings nearly complete and ready for interior fit out first thing in the New Year. The owner has now sold both units off the plan, and the race is on to complete the build in time for their new owners. 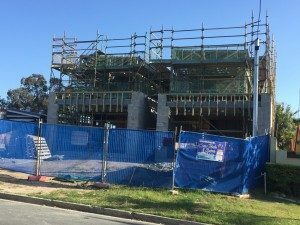 The general consensus in the building industry is that the faster you go on a building site, the worse the job will be. This is just not true. These days with the latest technology and good builders, you don’t have to sacrifice speed to do a quality job. Check out my blog, Building: Quality vs Speed in the building industry. I would like to take this opportunity to thank the hard working team at J&B Projects; all our suppliers, subcontractors, clients and followers. Another successful year nearly over and it’s all down to their support throughout the year. A very Merry Christmas and a Happy New Year, see you in 2017.